How Can I View the Live Streams Available at bet365 Sport? If you are a member at bet365 Sport (and if you aren’t, then click on the following link to take advantage of the latest bet365 Sport New Player Welcome Bonus) then you will be aware that your membership of the site offers you access to a number of different things. Firstly, you can use the same log in detail to access the other bet365 sites in the family, such as bet365 Poker, bet365 Games, bet365 Casino, bet365 Vegas and bet365 Bingo. Furthermore, you can transfer funds between each of the accounts you have for these sites quickly and easily within the banking section of the site. You can also use a number of site features, such as the Bet Builder section to create your own personalised bet on any football match, you can set up Live Match Alerts to keep you right up to date with the latest information on your chosen games. You can also use the Edit Bet to add, swap or remove selections from your initial bet or the Match Live service for real time updates across a range of sports. However, if there is one section of the bet365 site that is perhaps the most exciting and potentially helpful to punters, or even just sports fans, it is the Live Streaming service at bet365. 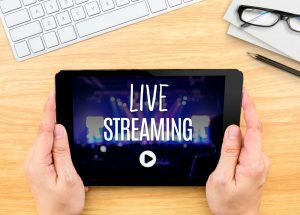 In this article, we are going to explore everything you need to know about bet365’s Live Streaming service, how it slots seamlessly alongside the sites In Play betting service and also what you need to know about Live Streaming so you can ensure you have it available whenever you require. Before we get down to the finer details of Live Streaming on bet365, let’s clear up exactly what we mean by a Live Streaming service. A live stream is simply a televised event that is being through a website for its users to view. A service such as the popular Twitch TV, which is used to showcase esports events, is a good example of a dedicated Live Streaming site. However, it is possible for other sites to carry streams too and this is what happens at bet365 Sport. 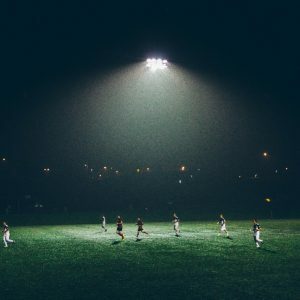 The company has an agreement to show Live Streams of a huge number of sporting events (though what you can view through the service is dependent on where you access bet365 from, we will explain this in more detail later). All you need to do is log in to your account and find the Live Streaming service at bet365, click the sporting event you wish to view from the scheduled list of events and if you fulfil the criteria to watch the stream (we will clarify what this is later in the article), you can view the event from here. A console will open which displays the event you have displayed and you can now view the event. In addition to this, you will also have a number of In Play betting markets displayed too, which allows you to bet on the action you are seeing on screen if you so wish. At bet365, you can bet In Play without Live Streams, or with them, although if you like to react to events happening within the sport you are betting on, betting In Play on Live Streams is a far more suitable and exciting option. Can I use Live Streaming on a mobile device or just a desktop? The good news is that you can access bet365’s Live Streaming service on a wide selection of the most popular mobile devices, as well as on a number of desktop computers. However, it is worth remembering that if you access Live Streaming on a mobile device and you are using 3G or 4G services to access the stream, rather than WiFi, then you could incur additional mobile charges if you go over your data allowance with your mobile provider. As such, if you are intending to use your mobile device to access Live Streaming services a great deal and you plan to use 3G/4G for this, then it is strongly advised to check the terms of your mobile contract and how much data allowance you have, and then make any changes to this necessary, to ensure you don’t get hit with a large bill due to exceeding your download capacity in any given month. What sporting events can I see Live Streamed at bet365 Sports from the UK? Although bet365 Sports carries a massive selection of Live Streams for a huge choice of major sports and events, the streams that are available in your own country do depend on whether the event or competition in question has seen the TV/Streaming rights bought by another company. If they have not, or bet365 own those rights, or the event is free to be streamed, then bet365 customers in the UK can view the event, assuming bet365 carries the stream of course. However, if the event or tournament in question does have a specific TV or Streaming rights deal in place, such as Champions League of Europa League football, or similar, then these events are not viewable in the UK, but can possibly be viewed from other countries around the world where no such right deal exists. 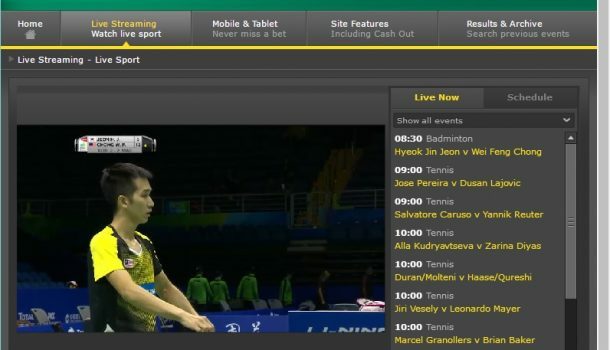 With over 70,000 events streamed every year, bet365 Live Streaming offers a massive choice of events to view including football, tennis, esports, badminton, snooker, horse racing, volleyball, cricket, basketball, ice hockey, handball, table tennis, netball and darts. That is a wide choice, even if some events may be unavailable due to your location. Is Live Streaming free to watch at bet365? Live Streaming Tip – The simplest way to ensure that Live Streaming is available at all times through bet365, is to leave a small amount of money in your account at all times. That way, you will always be able to view a live stream. 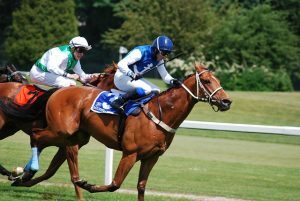 If you meet either of the above criteria, then you are free to view any of the available Live Streams shown on the site, with just two exceptions – which are horse racing and greyhound streams. Bet365 does carry streams of all horse races and greyhound races from the UK and Ireland on the site, but these are not available to view as standard sports above. Instead, you need to place a bet of at least £0.50 (£0.25 each way) on the race for horse racing, or £1 (£0.50 each way) on the greyhound race, that you wish to view the Live Stream of. Once your bet is placed, a few minutes before the race, the Live Stream will be available for you to view and you can then click on the button, sit back and watch the race unfold. Every race you bet on at courses in the UK and Ireland with bet365 will have the live stream of that race available to you. If you want to conduct a little research into a horse you want to potentially back, then the great news is bet365 also archives its live race streams, so you can access them from the Racing Archive at any point in the future. 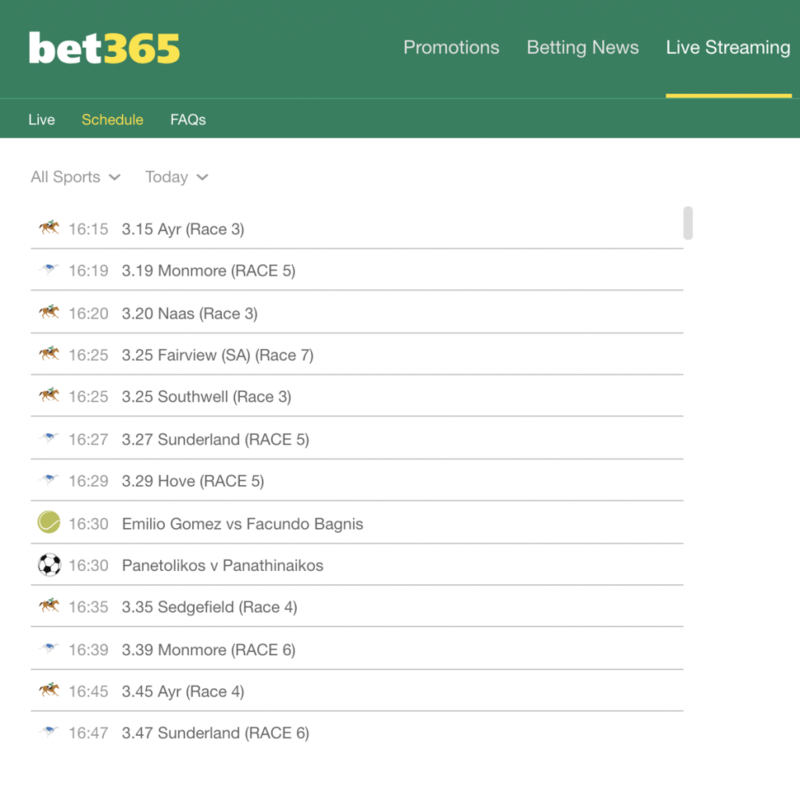 Bet365 produce an extensive schedule of events every day for Live Streaming on its site and it is always a wise move to check through the list to see if there are any events that you would like to watch and bet on. The seamless way Live Streaming fits in with In Play betting on the site has made the bet365 Sport Live Streaming service one of the most impressive features on the site. Why not check it out today and see what all the excitement is about.